Evan Kleve, who marched soprano for the Bluecoats in 2001 and 2002 (his ageout year), sent in this one. "Some good advice is never to get a tattoo unless you are 100 percent sure it's something you'll never regret. I always sort of wanted a tattoo, but I could never really commit to anything. Then my life changed when I got into the Bluecoats. I am tremendously proud of my experience in the Bluecoats and I wanted it forever immortalized on my arm. There's no way I'll ever regret getting a tattoo that represents such an extreme accomplishment. "I finally got around to getting this tattoo exactly one month before move-in 2002. I made the artist swear to me that it would heal in time before move-in, because I was going to be spending an insane amount of time in the brutal sun. It had just barely healed on move-in day. 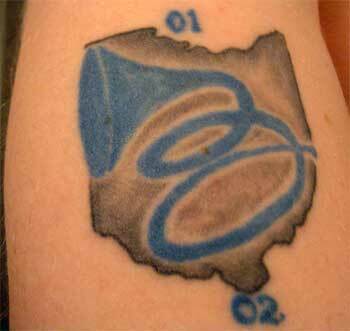 "I love my tattoo because it was on me for every show in 2002. Every time I look at it, it takes me right back to that field in Madison and all the practice fields that we gave so much of ourselves on. It's also a reminder that I can accomplish anything I put my mind to."